About this object Jonathan Trumbull of Connecticut served as General George Washington's aide de camp during the Revolutionary War. 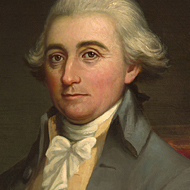 In the House, Trumbull served as Speaker of the House in the Second Congress. Emergent political factions made the 2nd Congress (1791–1793) contentious. One group favored President George Washington and his decision to strengthen federal authority, while another sniped at his Treasury Secretary, Alexander Hamilton, for having centralized the nation’s banking power. Factionalism got so bad that some Members attempted unsuccessfully to investigate Treasury Department operations. This Congress established the post office system, required all able-bodied males to join a state militia, and enacted a Fugitive Slave Act. The House, in its first congressional investigation, examined a military disaster on the western frontier after American Indians routed U.S. troops. The House of Representatives passed a bill establishing the first Bank of the United States. The House chose Connecticut Representative Jonathan Trumbull, Jr., as Speaker of the House.